Woohoo, the weekend is finally here! I am so glad the week is over, it was another busy one being short-staffed at work and many people in our department on vacation. The good thing about being so busy is time flies, but it’s exhausting and I sometimes struggle to find energy to catch up on house work and hit the gym after a long day. I’m starting a half-marathon training schedule again to do the Urban Cow Half Marathon for the third year in a row. I’m even more excited about it this year because my husband, sister, and brother-in-law will doing it too. It’s a tough half to train for because it’s during the hottest part of the year, we’ve been dealing with triple-digit heat most of this week. For me that means early morning long runs outside on the weekends and running on a treadmill at the gym after work on the weekdays. But treadmill running isn’t as bad as I thought it would be, I just zone out to a good playlist and have fun checking out other runners. 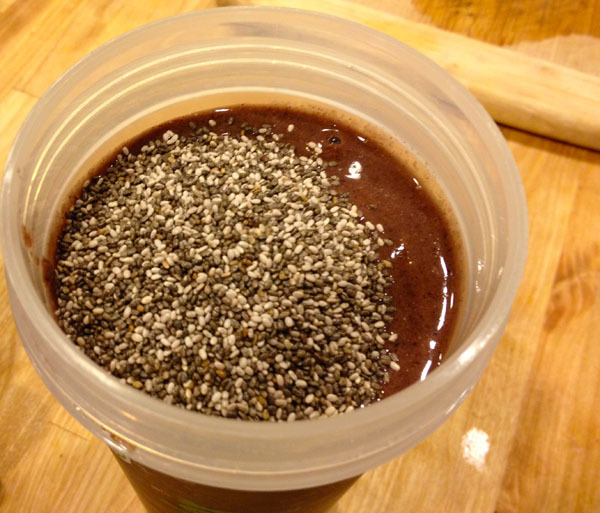 I’ve also been adding more chia seeds to my diet with the increased running by mixing them whole into breakfast smoothies for a hybrid smoothie/drinkable chia seed pudding. 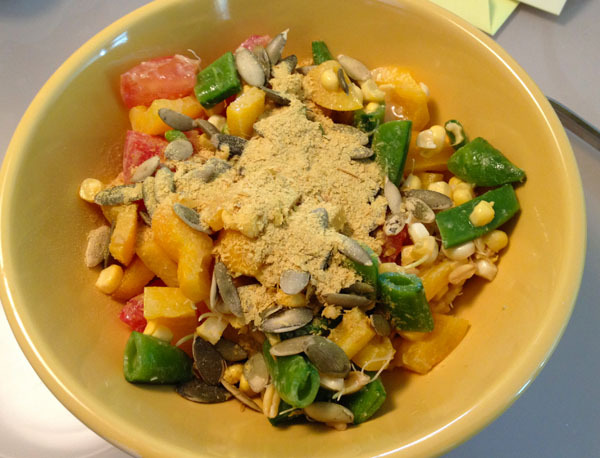 The seeds add a fun tapioca-like texture to smoothies and make them more filling to get through busy work mornings. This week has consisted of lots of salads in the heat for lunch and dinner, they’re perfect for a cool and hydrating meal. 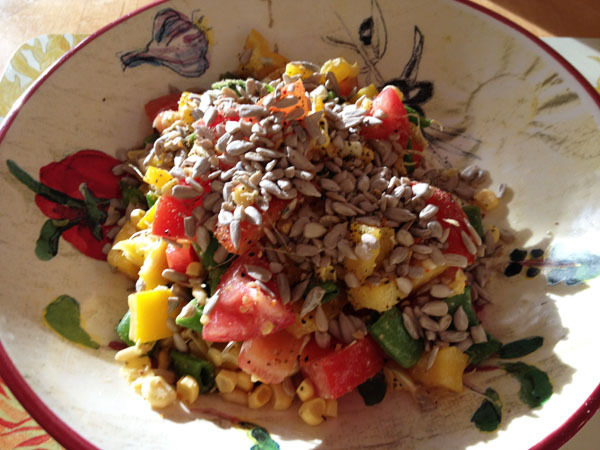 Some of them have been interesting combos, like this one with chopped yellow bell pepper, fresh corn, pumpkin seeds, sprouts, chopped tomato, and nutritional yeast. 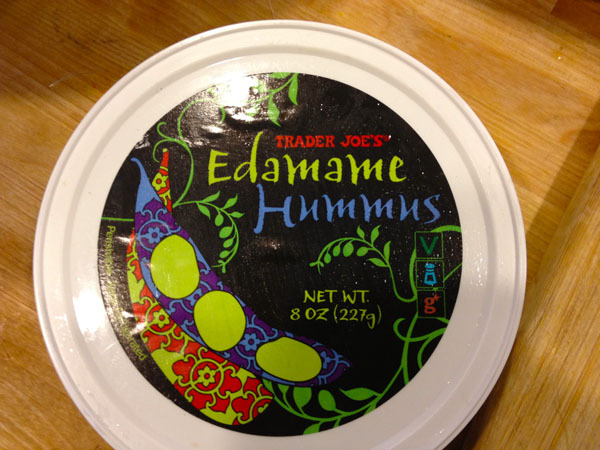 Another combo using Trader Joe’s Edamame Hummus for the dressing. I just mixed a huge spoonful of the hummus, a couple of tablespoons of apple cider vinegar, and nutritional yeast for a creamy dressing that came out nicely tangy. Last night’s dinner was a bit more of a challenge, I met a bunch of co-workers at Chevy’s for a little end-of-the-week happy hour celebration. The group ordered a few bowls of guacamole which should normally be vegan, but they topped it with cheese. Hubby reminded me this is a traditional Mexican version, but not a vegan thing! But I got another bowl to myself sans cheese at no extra cost, nice! 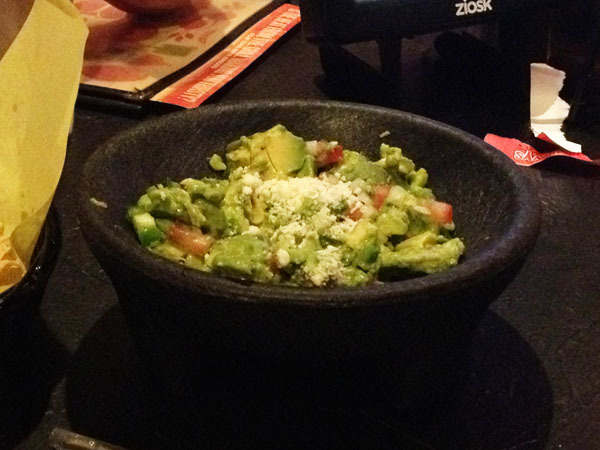 So last night was a dinner of chips, salsa, guac, and a watermelon margarita… or two. I love your salad bowls- so bright and cheery and hope you get some downtime this weekend! I just came across your blog…wow! I have a friend that is trying out veganism for a couple weeks, and I have been debating over whether or not I’d like to give it a shot. (This is coming from a Texas…we love our meat and queso!) I’m excited to read through a few of your posts to understand veganism a bit better before persuing it. Thank you! Hi and welcome! I hope you can find plenty of helpful information here, please contact me if you have any questions. It’s a big transition that probably too me 6 months to fully convert, but I really love it now not missing dairy or meat. Seafood was probably the hardest for me to give up, but it’s been an adventure trying so many new vegan recipes and creating wonderful sauces and dressing in a blender that ate veggie based. I recommend getting a vegan recipe book like Veganomicon and trying recipes from it for 3-4 weeks, with all the new flavors and textures, you won’t miss the old foods as much. yay for some time to decompress this weekend. also so glad you are staring your half training program and how fun your hubs is joining you! Thanks I’m thrilled to be running it with family – it makes training and the event so much more fun!